Fair. Fast Dispatch. Expedited UK Delivery Available. Excellent Customer Service. Most people that know anything about this book know that it is the book that introduced Hannibal Lecter from Silence of the Lambs, but in my opinion this book is one of greatest books in modern American fiction. I first read it over twenty years ago, and purchased this copy for my sixteen year old daughter. She devoured it and gave it rave reviews. Probably not for the squeamish, but if you enjoy a good thriller this is a must-have book. I absolutely loved this book!! It is so different from the movie! (Which I loved!!) There were so many twists and turns and sooo much suspense!! Definitely worth the read! First off I have to say I?ve read the Hannibal cannon since I was a teen (Red Dragon, Silence of the Lambs, Hannibal- Hannibal Rising doesn?t count) and Red Dragon is one of the best of the trilogy. A truly, disturbing, nightmarish gaze into the twisted mind of a serial killer. Even after finishing Silence, Hannibal it was Dragon that festered in my mind, not Silence or Hannibal. In fact it?s never really left. And it never will. 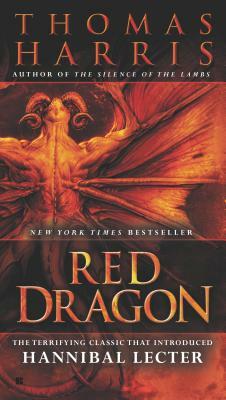 Red Dragon?s plot is fairly simple, but deeply distorted in a chilling way. The only way to describe it would be like stepping into a dark, decaying, roach infested basement naked, blindfolded, with the unmistakable sound of knives being drawn across each other and the demented howling of the damned rushing in your straining ears. Will Graham is a retired FBI profiler burnt out by the countless horrors he has seen is called back into the hell he swore he left behind him to track down a deranged slayer of families called The Tooth Fairy. A frightening creature with a fetish for biting and broken glass, a tormented man who was once a horribly abused child, a demi-god of death with a fearsome friend of chaos, The Devil. Harris layers on the terror of the increasingly bizarre case in the placid land of California, where the sun shines golden on darkened, bloodstained houses, where closed door muffle the sound of dying screams. And the Red Dragon runs rampant. The pages will flying, specks of gore on your sweaty face, as you walk in Graham?s haunted shadow as he tries in vain to shelter his new family from the shroud of dead his job brings, worming into the Tooth Fairy?s mind with eyes wide open. Falling, falling, falling into the darkness? As the case becomes more convoluted, Graham turns to the only person he can. Make no mistake, you won?t forget Red Dragon, as a dark crime novelist myself I can say I haven?t yet seen a horror/crime novel top it. Not even Hannibal. I?ll meet you in the dark side of hell. Harris is probably one of the greatest writers alive today and Red Dragon is proof of it. This is a very scary serial killer tale, which introduces the world to Dr. Lector. Graham is a smart foil for Lector. Lector also appears smarter in this novel than in the later ones. The narritive is also well done.